The Maltese breed dates as far back as the earliest Greek civilizations. Further even, if you take into consideration the ancient Egyptians which depicted Maltese-looking canines in their artwork. Ages ago, these dogs were worshipped, thought to have healing powers, and immortalized in legends of old. This makes them one of the oldest toy dogs in existence. However, despite knowing their deep lineage, experts cannot pinpoint where the Maltese originated. What we do know is that they showed up in 15th century Europe, and were favorites of aristocrats living amidst the reign of Henry VIII. By the 16th century they’d become extremely popular with nobles and royal ladies, and then went on to become the glamorized companion of many kings and queens. Despite their rapid rise to popularity, the centuries following were nearly apocalyptic for the Maltese; breeders almost drove the breed extinct by trying to produce a Maltese the size of a squirrel. Once this end was realized and people rose to preserve the line, breeders crossed the Maltese with an assortment of smaller dogs, creating various types of the breed. Yet it’s in the early 19th century, in England, where breeders crossed the Maltese with the Bichon Frise (and a few other canines – although their presence is not as apparent), that we have the Maltese we know so well today. By the mid-late 1800s, they were imported to the US, and eventually recognized by the AKC in 1888. Their popularity never died. In fact, being that they were at the forefront of ‘dog culture,’ the toy breed became an immediate favorite which it remains to be today. The Maltese is one of the most well-mannered and gentle toy dogs in the running. A direct contradiction to their aristocratic ancestry, the Maltese personality is loving, docile, and eager-to-please. While they’re cute enough to get away with being mischievous and are often used to ‘having it their way,’ obedience training—paired with their intellectual capacity—should be enough to keep them behaved. In terms of others, a Maltese usually thinks of the world as their friend, and their friends as people they want to love. This of course can be inverted if the Maltese does not receive early-socialization, which is why it’s so important. However, setting their overt friendliness aside, they’ll also bark or bite at strangers and children they feel threatened by. They’re actually a fearless breed and suffer from ‘little-dog-syndrome,’ and when they want to assert their presence they do so skillfully. An indoor breed, housebreaking a Maltese—aside from their natural stubbornness—is an easy task. They’re small enough to be litter-box trained, and won’t need hours of exercise or excessive exposure to the outdoors. Be aware, these people-loving canines have a huge issue with separation anxiety, and will become destructive and yappy if isolated for too long. Although Maltese characteristics are dignified and spunky, they’re also both docile and intelligent. This makes them easy to train, if given enough attention. Eager-to-please and affection-craving, obedience training is something they actually enjoy, because it means creating a deeper relationship with their owner. To that effect, being that they love their owner so much, if they feel mistreated or fearful it’ll affect them more than most breeds. Point being: a positive reward system works best with a Maltese. Holding too firm a hand, or scolding them rashly will only create anxiety and introversion in their adult years. Use treats, toys, and praise as words of encouragement when your Maltese behaves properly. Puppy classes and early-socialization is a must with this breed, as without early training and stimulation they tend to become grumpy adults. A Maltese requires around 40 minutes of exercise per day, split into two walks. A common mistake made with this breed is to suppose that because they’re toy dogs, they don’t need much activity. The truth is they do. Naturally pent up with energy, a Maltese—especially a puppy—will crave a consistent release. While you can’t expect them to be your partner in vigorous activities, you can play fetch with them, watch them run around the yard, and take them for brisk walks. A Maltese that doesn’t exercise is prone to demonstrate bad behavior, anxiety, and be destructive within the household. They’ll also be less healthy, being that their muscles need strengthening and their hearts need the stimulation. They’re small household dogs, sure, but their bodies need to develop too. Do note that Malteses don’t fare well in weather conditions lending toward extremes. Meaning, they don’t do well in above-average heat or cold. If this is the case, shorten the walks to ensure your Maltese does not overheat or fall ill due to the cold. The Maltese life expectancy is anywhere from 12-15 years. The Maltese ranks 33rd in the AKC’s most popular list of 155 dog breeds. While certainly up there in popularity, the reason they’re not in the top 20 (or even 30) is because they can be a fickle breed not entirely fit for the modern family. More specifically, they’re not the perfect fit for small children, nor are they big enough to serve as guard dogs for the household. Despite, their toy-like characteristics and charmingly people-loving personalities are what make them coveted. This is a breed that’s been popular since the earliest days of mankind. A Maltese should eat around a half cup of dry food per day, broken into two equal meals. These dogs—while not as common—can be prone to obesity. This is due in part to their build, but also because of a lack of exercise. Make sure to monitor your Maltese’s food intake versus their activity-level, and keep a keen on eye on how their physique develops. Be aware that this breed—which fits their character—can often be picky about food choice. Expect to go through different types/blends of food before finding the right fit. As with all dogs, age, metabolism, activity-level, and weight are all factors that need to be assessed when creating a balanced diet. A Maltese’s coat is its most identifiable trait. Silky, long, and snow-white, these dogs glimmer with elegance. Many are considered to have hypoallergenic coats, but be warned: this is not always the case. Another attribute to their coats is they shed very little, being that the undercoat is nonexistent. In regards to upkeep, the Maltese coat tends to knot. You’ll have to spend ample time working out the mats with a detangle spray or natural coat oil, and then using a light comb to brush their hair. Also, this breed grows hair on their ears that will need to be trimmed. Consult a veterinarian or a groomer on the best way to do so. It can be a tricky task for new pet owners. Hygiene upkeep is a must with this breed. Brush their teeth 2-3 times a week to avoid tartar and plaque buildups. Check their nose, eyes, ears, and their bodies for infection (usually announced by a strong odor), inflammation, discoloring, redness, or parasites. Trim their nails 1-2 times per month, as a Maltese will generally not wear them down naturally. Introduce these checkups and grooming sessions early on, so to accustom them to the process ongoing. Are Maltese’ Good with Children? A Maltese does not do well with young children. Reason being, they’re small enough that they can often be injured if handled poorly, and prone to be aggressive if they feel mistreated. These are delicate animals that respond poorly when their bubble is breached, a threshold children often ignore. While they’re not the best fit, it doesn’t mean that proper socialization—especially if the dog and children are introduced early on—can’t curb the problem and make them a great household pet. As with all dogs, if you decided to incorporate a Maltese into your children-present household, it’s important to establish barriers on both sides. Teach your children how to properly handle the canine, and teach the Maltese respect and obedience in dealing with the youngsters. Hip Dysplasia: a condition that manages to afflict almost every dog breed, this occurs when the thighbone and the hip joint do not sit flush. Simply, there’s a displacement between the two. Symptoms include difficulty walking, lameness in the leg(s), immense pain, and an abnormal gait. There are multiple treatments for hip dysplasia, however, not all of them require surgery. Do know that hip dysplasia can be screened for, and it’s important the puppy’s parents passed these screenings. Patellar Luxation: this condition occurs when the knee joint perpetually dislocates. The patella is in the kneecap, and luxation means the dislocation of a part connected to bodily structure. Although this condition is often terribly painful, the dog can usually carry on existing and even adjusting their gait to compensate for the afflicted leg. Treatment is available for this condition. Progressive Retinal Atrophy: this degenerative eye disorder occurs when the photoreceptors in the back of the eye fail. It begins first with night blindness and then worsens ongoing. While the vision impairment gradually increases, eventually PRA leads to complete blindness. However, an adjustment period is allotted, being that PRA can be diagnosed well before it comes into full-effect. The dog will then rely on other senses for navigation and survival. White Dog Shaker Syndrome: this is a condition almost exclusively found in white dogs (hence the name). Symptoms usually include tremors, a lack of coordination, high levels of stress, anxiety, and over-excitement. While this condition isn’t threatening, nor will it affect the personality of your canine, it can be very troubling. Treatments do exist for this condition. This saved her to be as old as she was. And it has actually put a spring back in their steps. 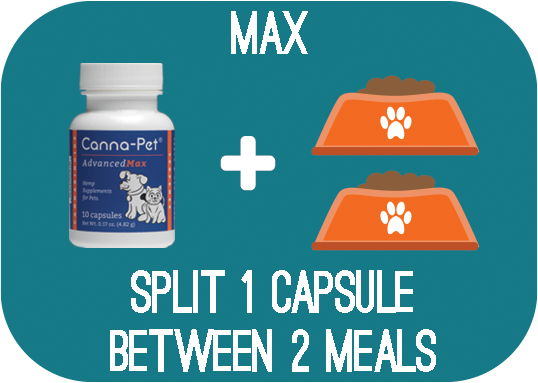 He is now 8, and since starting with the Canna-Pet Max oil, his anxiety and seizures have significantly decreased!